What started off as a clear summer star filled night sky soon changed into something very different. While I was taking astrophotos in the Pawnee Grasslands, the southern sky became charged with the brilliant glow of lightning. Soon the billowing cumulonimbus clouds filled the sky overLongmont Colorado. The rest of the sky was still clear with the summer constellations. 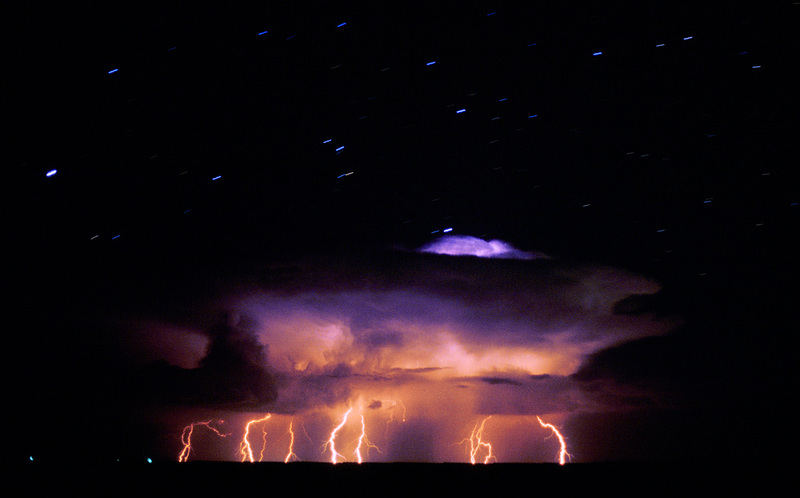 This picture captures the unique energy of that night with star trails clearly seen above the towering cumulonimbus clouds. The photo was taken with an Olympus OM 1 camera and a wide angle lens. The exposure time was 15 minutes on Kodak VS 100 slide film.